Decorative options can enhance the beauty and style of your home. Choosing the optimal low-e for your windows can improve both the comfort and the clarity of your windows. 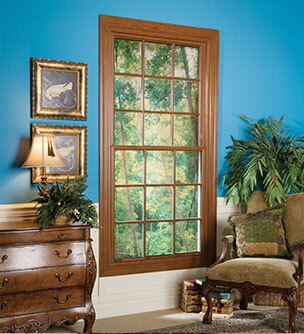 An additional thing to consider is how your decorative options may contribute the performance of you windows. Below is a list of options and how they may affect your window performance. Simulated divided lites and internal grids can improve the solar heat gain of your windows by helping to block out more light. Decorative art glass in our windows is not filled with argon insulating gas. However, it can offer the insulating benefits of clear triple pane glass. Having your windows installed with a full frame replacement type install allows you to ensure your windows are properly insulated and the studded opening around your window is checked for structural integrity. By properly insulating around the window, you can reduce sound transfer from the exterior to the interior of your home. Windows with Sunblinds cannot be filled with insulating gas, however, the blinds help block out sunlight and solar heat, improving solar heat gain. When selecting a glass package, first consider the recommended glass packages for your area according to ENERGY STAR®. Next, look at whether the glass package is filled with argon or krypton gas. Argon gas is a great insulating gas that helps improve the U-Factor of your windows. Krypton gas is an even better insulating gas that can help improve U-Factor. Krypton works best in small air spaces, and is only available in triple pane units. For more information on how decorative and other options can affect the performance of your windows, please see your Sunrise dealer.